Remember, it is prohibited to fertilizer between November 1st and April 1st. During this time the likelihood of fertilizer leaching beyond the root zone and into the groundwater is high. The ground is also more likely to be frozen during this time period, so the possibility of runoff into storm drains is high. Fertilizing your lawn at the right time will help ensure the grass is getting fed when it is most beneficial for the turf. 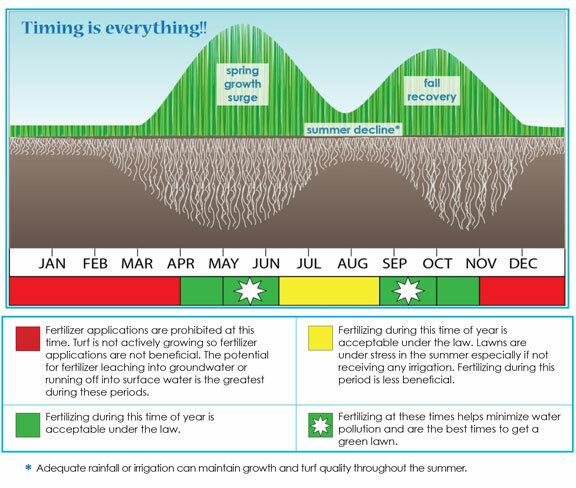 Although you can fertilize during the summer months this is not the most beneficial time for our cool season grasses. Their growth slows down and they are often under stress unless irrigated. There may also be a higher potential for disease occurence with lawns that are heavily fertilized in the summer when weather has been hot and humid. Fertilizing during the starred periods will give the best results.